The first Jericho Sims story is now available. Back in November of ’14, I participated in the annual NaNoWriMo event, and dropped 60000 words on a Jericho Sims novel. I will be adding to it this November to make a true novel from the bones I have established. 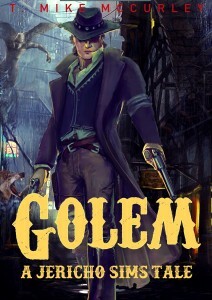 “Golem”, however, is the first in a series of short stories. It chronicles the events following Jericho being shot with an arrow and stumbling across the home of a mad scientist who has created a new mechanical soldier. The Jericho Sims stories will tie together various genres of writing, a little bit at a time: Western, Science Fiction, Supernatural, Romance, Paranormal Romance, Steampunk, and more than a few others. I hope that readers will be pleasantly surprised by the events they uncover as they follow this gunslinger on his quest to locate the demonic surgeon who murdered his fellow soldiers.